When your drains are continuously clogging, over-the-counter drain clog solutions are often not the answer. Master Plumbing & Mechanical uses the latest technology to snake and thoroughly unclog your plumbing. Drains clog and are hard to clean. This is an unavoidable plumbing issue that every homeowner will experience, some more often than others. Drain cleaners that you buy in the stores can compound problems and result in damage to your pipes, which could cost you more over the long-term. Our professional plumbing technicians can best identify the source of the problem through inspection, and determine the most appropriate course of action to restore your drain’s flow. 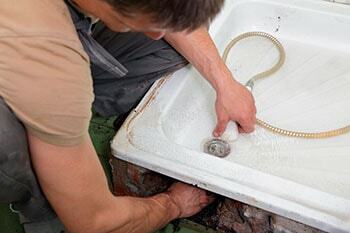 Diagnosis will determine whether the drain needs a quick cleaning or a full repair job. Technicians with quality training can quickly identify the issue and advise you of the process to remedy it. A basic drain cleaning is a fast process. If necessary, a more involved repair and replacement of blocked or damaged drain pipes can restore your drainage to optimal flow. Hair is the most common cause for household drainage clogs, particularly in showers, tubs and bathroom sinks. Using a drain cover can catch some, but not all, of the hair to prevent clogs. Hair is best removed through periodic professional drain cleaning, rather than application of store bought drain cleaning solutions. Grease is a major culprit in clogging kitchen drain pipes. Any greasy or fatty substances washed down kitchen drains will stick to pipe interiors and eventually build up enough to restrict flow. It’s best to avoid pouring fat and grease, such as bacon grease, down kitchen drains, but a drain cleaning can remedy the issue if necessary. Foreign objects, such as soap, food, toilet paper roll tubes, and children’s toys are another frequent drain-clogging culprit. It’s possible for an object to only partially block the drain, but continue to collect more debris and buildup over time, eventually blocking drainage entirely. Whether you need a quick fix or some extensive repairs, Master Plumbing & Mechanical will provide you with an accurate diagnosis, a preliminary quotation with no hidden fees and a detail of the process we will undertake to correct your drain issue. Master Plumbing & Mechanical services the Washington, D.C. metropolitan area. Contact us for help with your clogged drains.